(4) sales agents, 5) manufacturer's representatives.Air Waybill The forwarding agreement or carrying agreement between shipper and air carrier and is issued only in nonnegotiable form.Arrival Notice A notification by carrier of ship's arrival to the consignee, the "Notify Party," and - when applicable - the "Also Notify Party." These parties in interest are listed in blocks 3, 4 and 10, respectively, of the Bill of Lading. AWWL Always within Institute Warranties Limits (Insurance purpose).B/L Abbreviation for "Bill of Lading." BAF Abbreviation for "Bunker Adjustment Factor." Used to compensate steamship lines for fluctuating fuel costs. Sometimes called "Fuel Adjustment Factor" or FAF. Bank Guarantee Guarantee issued by a bank to a carrier to be used in lieu of lost or misplaced original negotiable bill of lading.Bill of Lading (B/L) A document that establishes the terms of a contract between a shipper and a transportation company. It serves as a document of title, a contract of carriage and a receipt for goods. - B/L Terms & Conditions: the fine print on B/L; defines what the carrier can and cannot do, including the carrier's liabilities and contractual agreements. - B/L's Status: represents whether the bill of lading has been input, rated, reconciled, printed, or released to the customer. - B/L's Type: refers to the type of B/L being issued. Some examples are: a Memo (ME), Original (OBL), Nonnegotiable, Corrected (CBL) or Amended (AM) B/L. - Canceled B/L: B/L status; used to cancel a processed B/L; usually per shipper's request; different from voided B/L. - Consolidated B/L: B/L combined or consolidated from two or more B/L's. - Corrected B/L: B/L requiring any update which results in money  or other financially related changes. - Hitchment B/L: B/L covering parts of a shipment which are loaded at more than one location. Hitchment B/L usually consists of two parts, hitchment and hitchment memo. The hitchment portion usually covers the majority of a divided shipment and carries the entire revenue. - Long Form B/L: B/L form with all Terms & Conditions written on it. Most B/L's are short form which incorporate the long form clauses by reference. - B/L Numbers: U.S. Customs' standardized B/L numbering format to facilitate electronic communications and to make each B/L number unique. - Negotiable B/L: The B/L is a title document to the goods, issued "to the order of" a party, usually the shipper, whose endorsement is required to effect is negotiation. Thus, a shipper's order (negotiable) B/L can be bought, sold, or traded while goods are in transit and is commonly used for letter-of-credit transactions. The buyer must submit the original B/L to the carrier in order to take possession of the goods.- Non-Negotiable B/L: See Straight B/L. Sometimes means a file copy of a B/L. - Split B/L: One of two or more B/L's which have been split from a single B/L. - Unique B/L Identifier: U.S. Customs' standardization: four-alpha code unique to each carrier placed in front of nine digit B/L number; APL's unique B/L Identifier is "APLU". Sea-land uses "SEAU". These prefixes are also used as the container identification. - Voided B/L: Related to Consolidated B/L; those B/L's absorbed in the combining process. Different from Canceled B/L. The above prices are estimations only and the cost of Containers changes monthly but this gives you an idea of what you will have to pay. All charges include the Local Thai charges for outgoing containers. 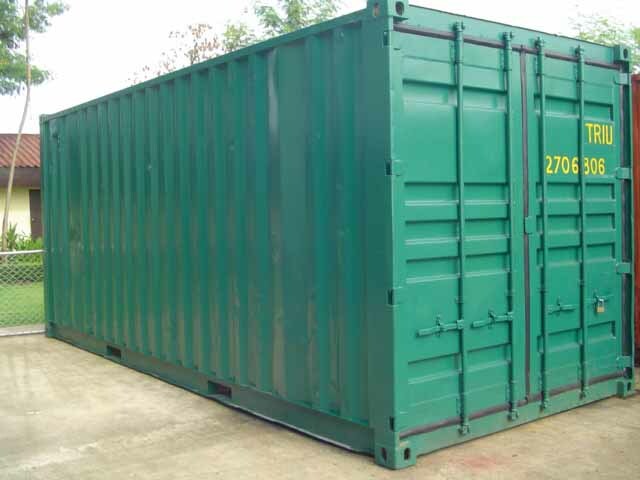 WE ALSO BUY 20 & 40ft FCL empty containers.